• At Black Gate: "Tsathoggua" by Michael Shea. Fantasy. "An elderly woman named Maureen, neatly dressed and manicured, sat on a bus-stop bench in San Francisco. She was watching the leisurely approach of an old shopping-cart vagabond up the sidewalk. Maureen believed in being courteous to everyone, but the vagabond woman strongly irritated her, perhaps because Maureen had put her dear little Buddy to sleep not so long ago." • At Mad Scientist Journal: "Quality Control" by JC Hemphill. Science Fiction. "Until yesterday, I worked in quality control at the Farmer’s Son peanut butter factory. You know, that big, shiny one over in Level Creek. The iceberg of peanut butter factories, the owners called it. Built to sink the Titanics of the industry. Jif and Skippy, beware!" At Classics On-the-Go: "King Frost" Audio. Children's Fantasy. At Daily Science Fiction: "Pavlov's Final Research" by Gary Cuba. Science Fiction. At Quantum Muse: "This Too Solid Flesh" by Robert Hegwood. At 365 tomorrows: "Self-Regulating" by Jae Miles. Science Fiction. At Toasted Cake: "Aunty Merkel" by Deborah Walker. Science Fiction. 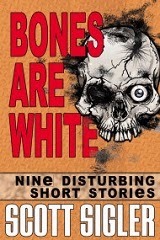 • At Author's Site: "Bones are White #11: Passenger, Part 3" by Scott Sigler. Military SF. "And now the conclusion of our military-sf novella PASSENGER. Marcus Crowley was shot through the heart (and you’re to blame, amiright?) and thought he was a gonner, but awakens to find himself not only alive, but on the move — and he’s not the one controlling his own motions." • At Beam Me Up: "Dave pt2" by Dean Giles. Science Fiction. • At Pseudopod: "The Blues" by Cameron Suey. Horror. "“The brick edifices lean over me, red canyons of abandoned history. Despite the lingering warmth of the late valley summer, dried leaves are already piling in the gutters. Without a human hand to clean them I imagine them heaping up, year after year, burying the small town in an endless leaf pile, patiently waiting in vain for a child to leap into them." Audio at Crime City Central: "The Creation of Ice" by Sandra Seamans, read by Veronica Giguere. Audio at LibriVox: Tom Swift Among the Diamond Makers by Victor Appleton. YA Adventure. Flash Fiction at Every Day Fiction: "Dinner Date" by Stephen Sottong.